These are the signs of our times, especially these election times. 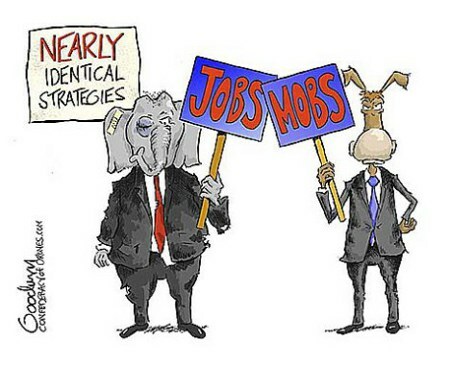 The Republicans stand for jobs, whereas the Democrats stand for mobs. Hence, Americans have a simple but stark choice before them right now. We can take the first, best step in stopping the Left, or we can meekly surrending to cowardice and allow our domestic enemies a victory over our nation, our culture, and our people. No not be fooled; do not be complacent; do not cleave to false hopes that you will not have to act. Our democracy and the very foundations of our nation are under existential threat right now, and all it will take for evil to win is for Americans to do nothing. This entry was posted on Monday, November 5th, 2018 at 9:34 am and is filed under 2018 Elections, Politics. You can leave a response, or trackback from your own site. 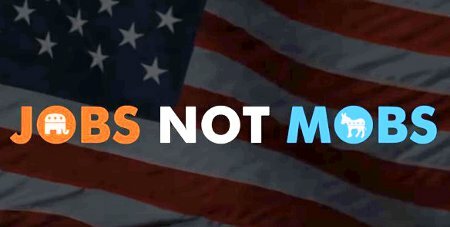 With the very important for the future of our nation 2018 Midterm Elections right around the corner, I believe that’s it’s imperative for each and every American to remember that the Choice Is Ours! We can vote for Republicans and jobs or we can allow the Democrats’ mobs to win over we, the People. It’s that simple and that dire. This entry was posted on Friday, November 2nd, 2018 at 6:59 am and is filed under 2018 Elections. You can leave a response, or trackback from your own site. Yes, it seems that old Bernie hasn’t learned his lesson and is considering running for POTUS again in 2020. 🙄 But hey! 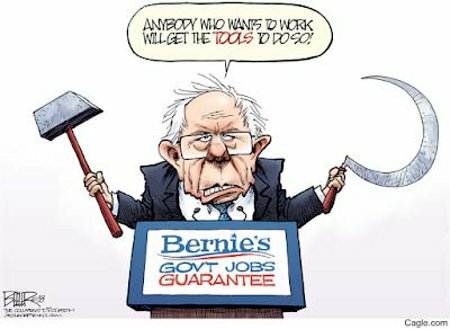 Bernie’s an avowed Socialist and, given how many times it’s been tried and how many times it’s failed at a great and bloody cost, it’s not too surprising that Bernie hasn’t learned his lesson. Yeah, that’s the thing; when you’re a socialist and every problem looks like the “Aristocracy” and the Bourgeoisie, the only tools in your kit are going to be a hammer and sickle. This entry was posted on Sunday, June 3rd, 2018 at 5:03 am and is filed under 2020 Elections, Politics. You can leave a response, or trackback from your own site. In truth, it’s hard to keep even a small office running smoothly. It involves a plethora of tasks and duties that are as needful as they are tedious. So we should appreciate our receptionist, our secretary, our administrative assistant, and most assuredly our office manager. She’s really a superheroine in business wear and a wonder in the office. A goddess, if you will, deserving of respect and worship. Who else can all that she does while, at the same time, so beautifying our work environment? This entry was posted on Sunday, August 16th, 2015 at 6:41 am and is filed under Humor, Society. You can leave a response, or trackback from your own site. I’ve said before that raising the minimum wage in order to provide the “poor” with the material standard of living they feel entitled to is a plan that will backfire, causing incalculable financial harm to the very people it’s meant to provide for. Well, it appears that, if you’re one of those who’ve been screaming to make $15 / hr to flip burgers, your future is now. 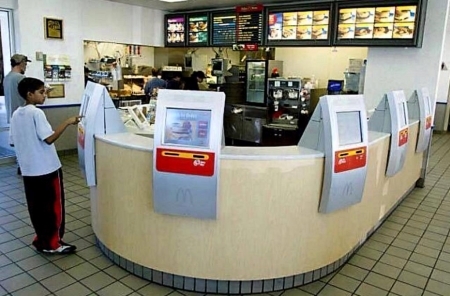 McDonald’s is piloting a new, cashier-free kiosk system in several major US cities after having great success with them in Europe. And this is just McDonald’s; others are moving this way as well. What is as telling as it is interesting is that, despite the hype, that these kiosks were developed to reduce labor costs, they weren’t. They were developed in order to speed up the ordering process and overall improve the customer experience…because the workers, who now want more money, couldn’t or wouldn’t do job as well as a self-service kiosk. And the above are just about the cashiers. Other automated systems are in development or early pilot to completely automate the fast food cooking process. Hence, soon there may be very few people employed in the fast food industry at all. Yes, to all those who’ve pushed, and pushed, and putsched to jack up the minimum wage I say, your future is now and it is bleak. This entry was posted on Friday, May 29th, 2015 at 12:24 pm and is filed under Politics, Society. You can leave a response, or trackback from your own site.